Okay so last February when I posted those chilaquiles I had zero intention of completely letting this blog go, though it had been increasingly more difficult to maintain with grad school. Then I became completely immersed in a dissertation proposal, started teaching an undergrad class, on top of yoga, a huge load of classes, and practicum. By the time summer came I told myself I couldn’t wait to dive back into recipe making but honestly I was so exhausted I ended up using the whole summer just to catch my breath. As sad as I felt to leave this little plot of the internet behind, I desperately needed rest, so I prioritized taking care of myself in other ways. Then in August I got pregnant. It was about as planned as a pregnancy could be but still incredibly exciting. I’ve had the baby fever badddddd, for several years now and was done allowing grad school keep my life on hold. So this Spring I finish my final class (a meager 1.5 credit elective) on Thursday and our sweet baby girl is due that Saturday. I cannot wait to spend every second of this summer with her until I start internship (like residency) full-time in the Fall and put this grad school life behind me. Being pregnant has been both blissful and unexpectedly challenging. The first trimester was hell on earth. I was so sick. All I ate was bread. I think I cried almost every day. It hit me way harder than I could have anticipated. But it ended and I had a wonderful 4 weeks or so starting in the second trimester where I felt amazing. Then Thanksgiving hit, I ate way too much butter, and this mystery gallbladder/rib pain took over. 1 gallbladder ultrasound (no gallstones phew!) and a couple of weeks eating a vegan diet later, and I’ve learned it pretty much hurts no matter what I eat so I might as well enjoy life (though I’m still avoiding fried food just in case). Fast forward to this Saturday I enter the 3rd trimester and I feel like I’m finally settling in. Feeling our girl kick and dance in my belly is still the most magical thing I’ve experienced in this life. My body has become her home and our connection feels like nothing I have ever experienced. I am completely obsessed and in love with her in every way. I haven’t had too many pregnancy cravings, with the exception of dried mango and berries. 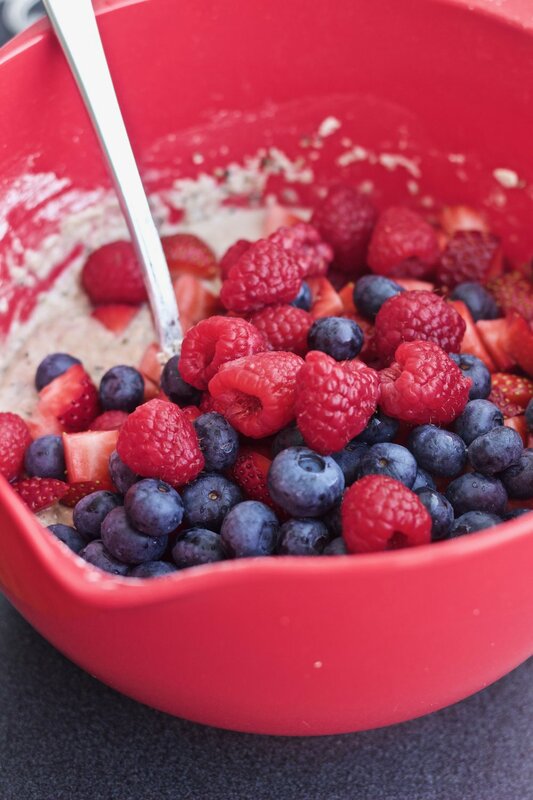 I wake up every morning and think “what breakfast can I top with a massive cup of fresh berries?” They are the most delicious things I’ve ever tasted and I don’t care one bit that they aren’t in season. I’ve been eating about a cup of fresh berries per day. Enter these pancakes. I’ve made them 4-5 times in the past month. They are so simple, sweetened with just banana, and filled with oats and berries. They are tender and come together so quickly! In a medium bowl smash the banana then mix in the oats and salt. Nuke this mixture in the microwave for about 30 seconds to warm then set aside for about 10 minutes while you prepare the other ingredients. Sprinkle in the cinnamon followed by the vanilla extract and egg, mix to combine, follow with the baking powder, stir to combine. Add the whole wheat flour and mix (it will be a little dry that’s okay), mix in the hemp seeds and 1/2 cup of milk. If you prefer your pancakes on the more biscuity side stop here, if you like them a little smoother/flatter (like me) I recommend adding another 1-2 tablespoons to thin the batter a bit). Heat your griddle over medium heat. 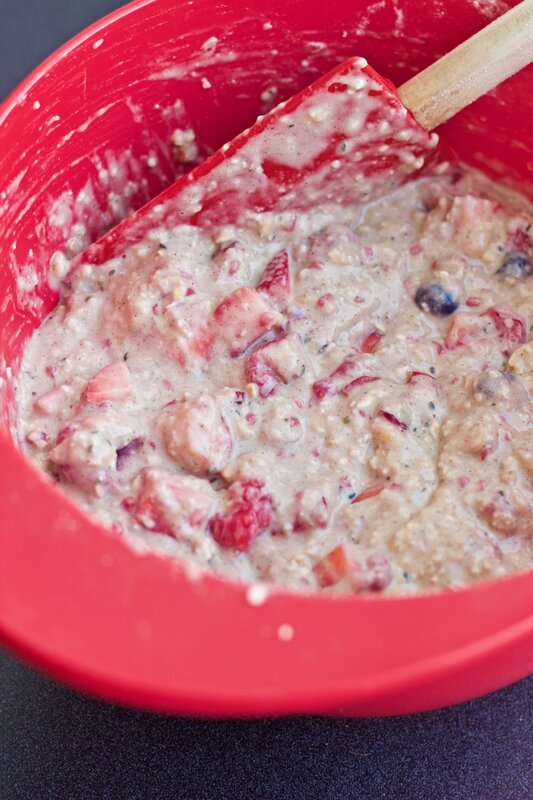 Meanwhile, stir the berries into the batter (it’s okay if they get a little mashed). Spray your griddle with cooking spray (or a knob of butter) and dollop 1/3 cup sized pancakes onto the pan to cook. Flip when lightly browned on the bottom and cook until set. Serve immediately. Top with butter, maple syrup and more berries if you’d like! 2017 was the year I finally got the courage to tackle sourdough! It's been on my bucket list for as long as I can remember so this summer when I had a couple months off I took the plunge. I used King Arthur Flour's starter recipe to create my own starter over about a week. For those of you familiar with sourdough you know that each time a starter is "fed" you need to discard about half of it. It can feel pretty wasteful, at least for me, until I realized you can actually use discarded starter for recipes like these waffles! I've since made these waffles what feels like dozens of times. The original version calls for all purpose flour and don't get me wrong, it's delicious. But I was hoping for something a little more sustaining so I loaded this version with protein-rich hemp seeds, spouted wheat flour, oat flour, and lots of seeds! The result is a waffle that's strong enough to eat for weekday breakfast and feel full until lunch. You can dress it up with maple syrup and whipped cream (like I did for my husband's birthday this week) or dress it down with almond butter and banana. It freezes beautifully and makes for a quick easy breakfast that just needs to be reheated in the toaster. And, like you'd expect it has that subtle lovely sourdough taste! If you've never considered making your own sourdough, these waffles are just one more excuse to take the plunge, it's well worth it! The night before you want to make the waffles combine all of the ingredients for the overnight sponge in a large bowl, cover and let sit at room temperature for 8-12 hours. The following morning, warm your waffle iron. Add eggs, vegetable oil, salt and baking soda to the overnight sponge and stir to combine. Spray the waffle iron with oil, pour batter into the iron and cook per the manufacturers instructions. Serve immediately! These waffles freeze beautifully in freezer bags between sheets of wax paper and re-heat excellently in the toaster oven!